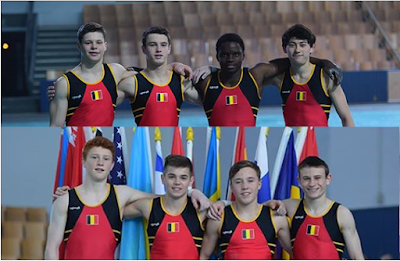 Belgian Gymnastics: 5 medals at the International Junior Team Cup in Berlin! 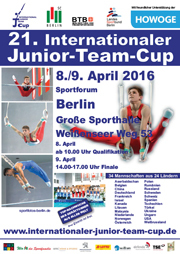 5 medals at the International Junior Team Cup in Berlin! This weekend, our juniors competed at the International Junior Team Cup in Berlin, one of the most prestigious junior international competitions in Europe. And the Belgians shone, winning 5 medals! The competition started on Friday, with the team and all-around final that also served as the qualification round for the event finals starting on Saturday. In the age group 1 (1998-1999), Noah Kuavita (Silok Deune) ranked 23rd, Takumi Onoshima (Athanor Gym Club) was 26th and Lukas Fickers placed 33rd (TSV 1970 Rocherath). In the age group 2 (2000-2001), Jonas Delvael (Gym Izegem) won a beautiful bronze medal! Justin Pesesse (La Vaillante Tubize) finished right off the podium and ranked in 4th place. Ruben Marx (Olympia Houthalen) was 19th, Emiel Tiebout (Rust Roest Brugge) was 24th and Mattis Bouchet (Vaste Vuist Lauwe) placed 27th. Team Belgium 1 (Noah Kuavita, Takumi Onoshima, Ruben Marx and Jonas Delvael) ranked 7th, while Team Belgium 2 ( Mattis Bouchet, Lukas Fickers, Justin Pesesse and Emiel Tiebout) placed 15th. The team competition was won by Switzerland ahead of Russia and China. 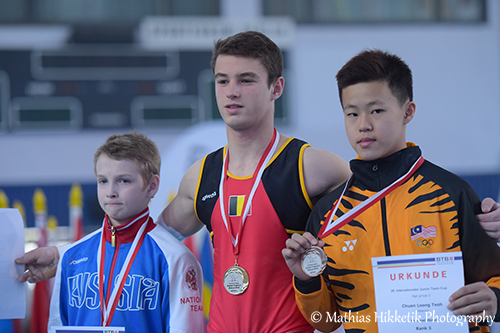 This Saturday, Jonas Delvael shone again, winning three medals, one of each colour! He first grabbed the gold on pommel horse and then moved on to win silver on still rings. 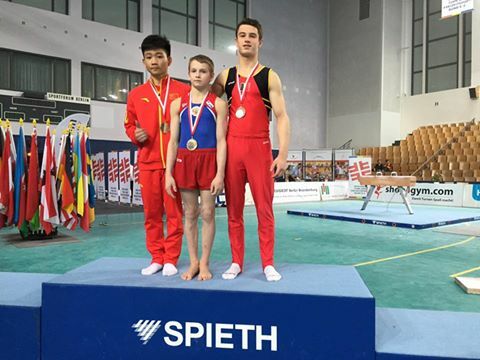 He then completed his collection by earning a bronze medal on parallel bars! 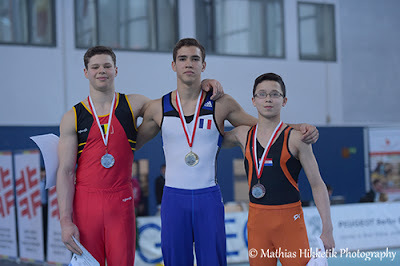 Ruben Marx won a silver medal on horizontal bar. Also competing in finals this Saturday, Justin Pesesse placed 4th on floor despite a fall, while Takumi Onoshima ranked 6th on pommel horse, after he fell too. He then placed 5th on horizontal bar. This competition is part of the selection process for the Juniors European Championships that will be held in Switzerland at the end of May. The last selection competition will be a friendly meet in Sweden where Belgium will compete against the host country and a team from the Netherlands.